Do you ever get discouraged when you read or hear about moms who seem to be perfect? You know, the one who's the perfect wife/mom/cook/employee/housewife/everything? I do! So Kendra decided that it's time to keep it real. With that goal in mind, she created a new meme so we can encourage each other by sharing our stories of imperfection. But oh, where to begin? If you read this blog regularly, you already know about my forgetfulness (like forgetting to put dinner in the oven and forgetting to buy the flounder that I'd planned to make for dinner). You've read about my cooking and baking disasters and near-disasters, like the broken heart cake. You know that I nearly killed my sourdough starter when it got pushed to the back of the refrigerator and forgotten. You've seen that our flower garden was neglected last summer (and, as long as I'm 'fessing up, I'll tell you that I never did get around to doing the fall clean-up there). Some of these things can be attributed to my medical issues, but some of it is because--shhh, don't tell anybody--I'm not a perfect housewife. The challenge I'll confess today stems from a combination of procrastination, perfectionism, and lack of a working system. You know how you come across great-looking recipes in magazines? I used to tear them out and tuck them into a large manila folder. But I could never find anything, so I started just keeping the magazines, every one of which has dog-eared pages. The other day, we asked "Mooseman" to move them to the floor so I could sort through them. That's when my tall but neat stack turned into a game of 52 Pickup. It's on my "Things to Do" list for today, and I'm determined to get to it! Oh, and as an aside, thank you, Photobucket.com, for offering to sell me a coffee mug and a t-shirt emblazoned with this image. For more Fess Up Friday, or to link up your own post, click through to visit Kendra at A New Life on a Homestead. But before you go, if you're looking for organization help, enter my giveaway for a Rubbermaid junk drawer organizer set, which ends on Monday. I used to do the SAME thing!! Finally I had to just stop getting magazines :) Thanks for sharing!! I've always been a magazine addict until I started receiving the dozen or so free subscriptions. Although I love reading them I often get so behind that I miss deals, contests and other fun/interesting stuff. 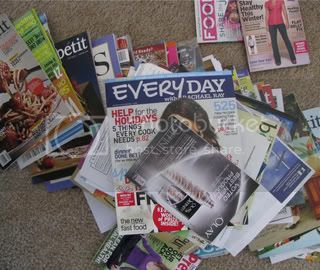 I'll be so glad when the subscriptions stop then I don't have to worry about the giant pile of recycling. There will be two or three that I continue. But 10 or more is way too many. Ummm...magazines are taking over my side of the bedroom. Literally, stacks of magazines all over the floor. It's on the to do list. All our stuff has been packed for so long, I'm not sure I know where they are, but I have hundreds of patterns and crafting magazines with projects I want to try... even if I live to 1000 years old, I'll never get all that done. It just won't happen, so why am I saving them? Why am I making my poor husband carry them from place to place? Well, right now the reason is because they are in boxes somewhere. I am determined to clean out the excesses when we start unpacking this time. I was dealing with this very issue today as I was trying to get ready for my sons friends that were coming over. Magazines are fun, but they stack up. Glad to see I am not the only one!